Used by more than 150,000 people, and the winner of more than 65 industry awards, 3ds Max is the world's most popular animation modeling and rendering software for film, television, video games, and design visualization. 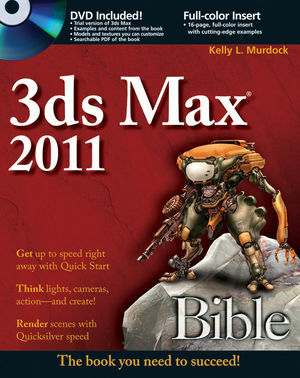 3ds Max Bible is the world’s most popular book for getting the most out of the software. Whether a novice looking to create something immediately using the Quick Start tutorial, or an experienced 3ds Max user who simply wants to check out the software's latest and greatest features, this update to the bestselling 3ds Max book on the market continues to be the most comprehensive reference on this highly complex application. The only comprehensive reference-tutorial on 3ds Max, it's no wonder the 3ds Max Bible is the bestselling 3ds Max book in the world and a favorite of both amateur and professional animators. With a background in engineering and computer graphics, Kelly has been all over the 3D industry and still finds it fascinating. He’s used high-level CAD workstations for product design and analysis, completed several large-scale visualization projects, created 3D models for feature films and games, worked as a freelance 3D artist, and even done some 3D programming. Kelly’s been using 3D Studio since version 3 for DOS. Kelly has also branched into training others in 3D technologies. He currently works as a production manager for an upcoming game company.